This 2 bedroom cabin boasts a height advantage to it's great view. The master bedroom has a king bed, the second bedroom has 4 singles - in bunk bed style. The bathroom is split making plenty of room for a family or group with both a bath and shower provided. The loungroom / kitchen area is spacious and fully equipped and an outdoor setting is provided on the deck for enjoyment of this fantastic location. 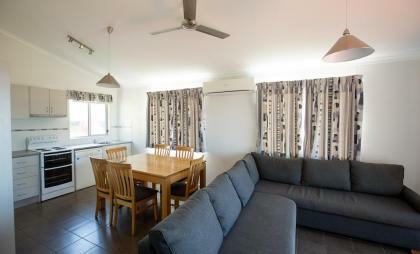 A luxury cabin which is fully self contained with a large kitchen and living area. Cabin has 2 bedrooms, sleeping up to 6 people. The main room has a King size bed, the second has 2 sets of bunk beds. Has deck with outdoor setting, with great views of the sea. Full bathroom with separate toilet and vanity.